Your pool will use less chlorine with far less work while still maintaining crystal clear water. That’s because the Aqua Smarte System uses minerals that make the water feel softer and look sparkling clean. Aqua Smarte's patented minerals destroy bacteria with a controlled release formula that lasts 6 months. Minerals also help keep your pH balanced by acting as a neutralizer. On a blazing hot day, dip your head under water and take a look around. You can actually see what the Aqua Smarte has been doing while you’ve been playing. If having fun and spending as little maintenance time as possible is your first priority, set the dial and go. The Aqua Smarte System with a pre-filled chlorine Bac Pac inside will do the work by dispensing the chlorine and minerals automatically into the swimming pool. 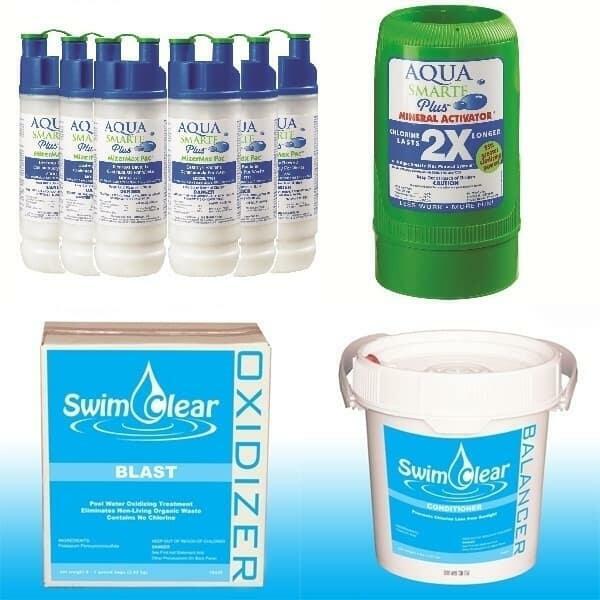 Aqua Smarte is one of the only mineral system with a prefilled chlorine pac that meets the EPA requirements to lower previously approved safe chlorine levels up to 50%. This is a very convenient way of reducing chlorine use and hassle. The Above Ground Aqua Smarte System makes it even easier for you to enjoy your pool. The enhanced control dial allows for more precise control over the minerals and chlorine going into the pool. When it’s time to replace the minerals (every 6 months or once a season) or the chlorine Bac Pac (every 2-3 weeks), the cap is a snap to remove. Simply grab the handles and twist it off. These great features add to the cool look of the Aqua Smarte System. Aqua Smarte knows why you bought your pool in the first place — to have fun. We know the last thing on your mind should be pool care. Aqua Smarte gives you a reliable way to have fresh, clean, clear water in your family’s pool. It’s easier too, with pre-filled containers that are recycled or discarded when empty. So this summer, put the Aqua Smarte System in charge and simply enjoy!